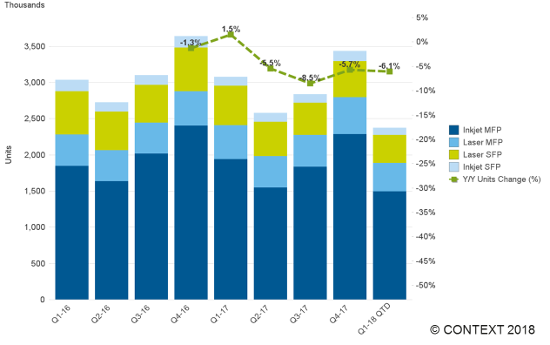 Sales of printer hardware through distributors in Western Europe (WE) during early Q1 2018 continued to follow the trend set during Q4 2017 and declined by -6% year-on-year according to the latest distribution data published by CONTEXT, the IT market intelligence company. Inkjet Multifunction Printers (MFPs), which account for over 60% of sales in WE, also fell by -6% during early Q1 2018 (weeks 1-11) and hence were the main driver for the overall change. Laser MFPs were the only category that registered a year-on-year increase in sales. Although this was small, it does reflect the ongoing shift from single-function to multifunction devices: the positive performance of this category was led by A4 colour laser MFPs and A3 laser MFPs. Revenue generated from WE distributor sales was up on that of the previous quarter, thanks to rising ASPs for inkjet devices, but it was still down by -3% year-on-year in early Q1 2018. The ASPs of Laser hardware continued to fall during this quarter. While distributors in most WE countries saw unit sales decline, there were exceptions. In France, there was an increase of +5% year-on-year because particularly strong sales of consumer inkjets offset the weak performance of laser hardware. Sales in the UK also grew during early Q1 2018. Following a flat performance in Q4 2017, distributors in Spain saw a sharp fall in sales of consumer inkjets which led to an overall decline of -11% year-on-year. Samsung’s share of the laser device market improved by 2.5 percentage points and it now holds the third largest market share in this sub-category. HP saw a corresponding decline of 1 percentage point year-on-year but continues to hold the largest market share with Brother following. HP also registered a very strong increase in market share for A3 business inkjets following the company’s acquisition of Samsung’s print business early in Q4 2017.